Will freefalling oil’s impact match 2009 on downstream markets? According to ChemOrbis, the downturn in energy markets gained speed again following year-end holidays. Crude oil futures broke below $50/bbl on NYMEX while Brent saw under $51/bbl on the second trading day of this week upon rising worries over a global supply glut contributed to by the mounting stockpiles in the US. These were the lowest levels seen since mid-2009. Spot naphtha prices immediately responded to the losses of the upstream energy market, refreshing records at 5 and a half year lows. Spot prices in Europe retreated below the $400/ton threshold while Asian values also hovered near this threshold. Players are now wondering whether polymer markets are resembling the levels seen when crude oil last hovered around the $50/bbl threshold in 2009. As can be seen from the graph below, China’s import PP market has hit the lowest levels seen since the last quarter of 2009. However, when looked at more closely on ChemOrbis Price Index, homo PP prices traded in the range of $900-1000/ton CFR China when crude oil futures on NYMEX traded slightly above and below $50/bbl in March-April 2009. In the same timeframe, in March-April 2009, import HDPE film prices in Turkey traded around the range of $1000-1100/ton CFR, cash including all customs duties if applicable. Nevertheless, the current average indicates a much higher level for HDPE film based on ChemOrbis Price Index. 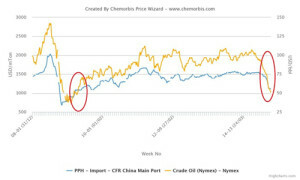 A similar situation is in place in Egypt’s import PVC market, where US PVC traded around $650-730/ton CFR in March-April 2009 while crude oil was hovering around $50/bbl. According to ChemOrbis, the largest gap between today and the levels in 2009 when crude was around $50/bbl is seen in the PS market. As can be seen from the graph below based on ChemOrbis Price Index, Italy’s spot GPPS market is trading well above 2009, when crude was around the same levels of today.